For an unknown reason, everyone outside the media, including both Republican and Democratic Congressmen, foreign policy analysts and Ian Bremmer (an expert on states in transition) have known literally for months that Mr. Putin has the grand aspiration of reuniting the USSR under the auspices of a trade agreement known as the Eurasian Union. The pretext of protecting ‘all Russian speakers everywhere’ is transparent as a pane of glass as to Mr. Putin’s true desire of being recorded by history as the man who brought back to life Russia as a global superpower. Yet, almost nowhere outside these somewhat elite groups, is the Eurasian Union ever mentioned. The media lags behind as they report what sanctions the U.S. and EU are imposing rather than why the U.S. and EU aren’t imposing stricter and more effective sanctions. The answer to which is quite simple. Oil. Sanctions would reduce Russia’s supply of oil increasing fuel costs for both the U.S. and the EU which would immediately drag on GDP. Later, this would undoubtedly be exploited by certain politicians to lay false claim that actions of the incumbent party are jeopardizing economic recovery. 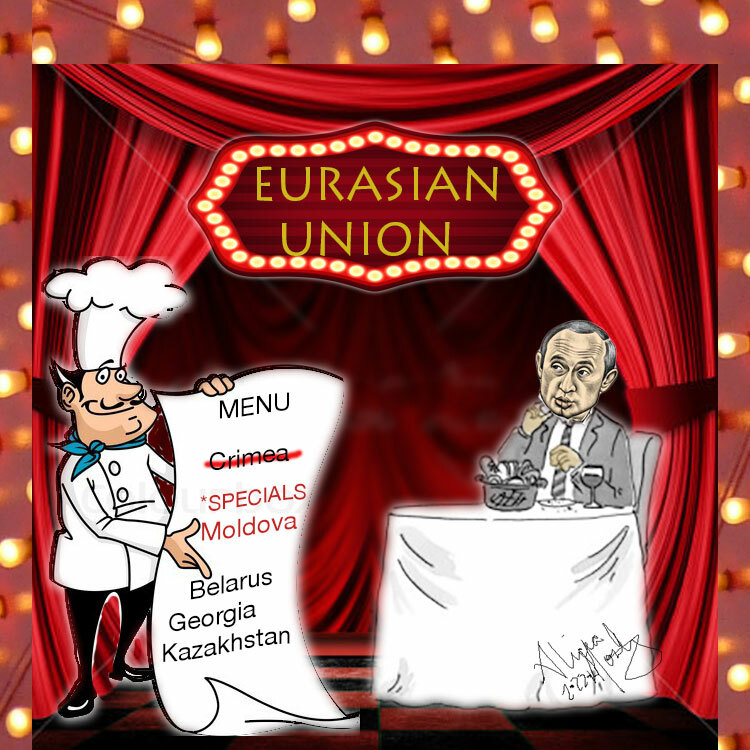 If Crimea was the appetizer on Mr. Putin’s menu, Moldova is the aperitif. On Tuesday, politicians from the Trans-Dniestrian region on the eastern border of Moldova appealed to the Duma (Russian parliament) to become the newest piece to the Eurasian jig-saw puzzle. This region is Russian speaking, culturally Russian and supported both economically and militarily by the Russian Federation. Also, Russia maintains a military presence in the region and would essentially land lock Ukraine from direct contact with the EU. Going back to my somewhat trite chess analogy, could Mr. Putin have made a better move? This is perfect. He can slowly smother the life of resistance from the Ukraine until it is starved into acquiescence and then move on to his next course, a selection of Georgia, Kazakhstan or Belarus.